In 1961 President Kennedy announced an ambitious – some thought impossible – goal of “landing a man on the moon in this decade.” In 2018, FEMA announced a similarly ambitious “Moonshot Mission” – to double the number of properties covered by flood insurance by 2023. This goal was set to build a stronger culture of preparedness across the United States. Why? Because insured survivors are able to recover quicker and more fully from a storm. When hurricane Harvey hit the Houston area in 2017, it caused more than $125 billion in damages, destroying homes and communities and displacing hundreds of thousands of people. While some homeowners in the area had flood insurance that helped them recover, FEMA estimates that 81% of homeowners outside the high-risk flood zones did not have a flood insurance policy. Those people were forced to rely on very limited federal assistance for any kind of recovery. The average individual disaster assistance from Harvey was between $4,000 and & 6,000. The average NFIP insurance claim payment in Harris County Texas after Harvey was $113,000. As you can see, being prepared can mean the difference between getting your life back to normal after a devastating storm and being left homeless… At Wright Flood Insurance, it’s our goal to help as many Americans as possible understand that low-risk doesn’t mean no-risk, and that everyone benefits from having flood insurance. In the spirit of helping FEMA reach its moonshot goal, our team has pulled together five surprising things that many Americans don’t know about flooding to help homeowners see how important flood insurance can be. From tropical climates and coastal regions to flat grasslands and even in deserts, dangerous flooding can occur anywhere, in a heartbeat. Records show that flooding disasters have occured in 98% of counties in the United States, including inland communities. In fact, some estimates say that inland flooding causes more property damage annually than any other disaster. These inland floods tend to be just as devastating as flooding in tropical areas, especially because so few inland homeowners understand their risk and have flood insurance to mitigate it. If you are interested in finding the right flood insurance policy for your home, visit www.wrightflood.com to connect with a local agent today. Hurricane Florence dropped an estimated 18 trillion gallons of water across seven states earlier this year, devastating homes and communities in its wake. While that’s a major storm, homeowners are often surprised by the amount of damage that even a smaller flood can cause. An inch of water inside a home can cause upwards of $25,000 in damage. The only way to protect yourself from having to pay for these damages out of your own pocket is by securing and keeping your flood insurance up to date. No matter what the flood maps in your area say about your risk, being prepared with flood insurance is the best way to ensure that if disaster strikes, you will be an insured survivor on the path to recovery. A true culture of preparedness includes preparing for the flood and preparing for after the flood with flood insurance. One of the most important things to know about NFIP flood insurance is that there is a 30-day waiting period from the time you purchase a policy to the time your coverage kicks-in. Consider that the time to insure your home or business with flood insurance is while the weather is dry! 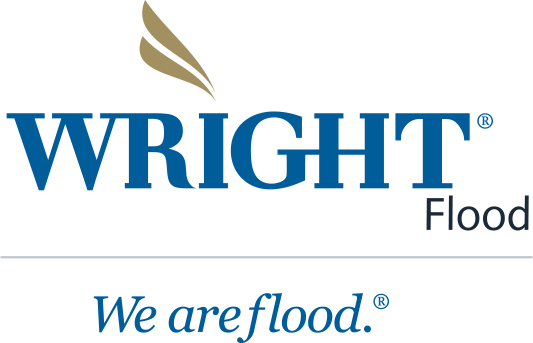 Call Wright Flood at 866-373-5663 to connect with an agent today to ensure that your home is covered in the event of a flood disaster. NFIP flood insurance is available in any of over 22,000 participating communities across the US for all types of buildings, regardless of your flood zone. Non-participating communities are rare. Mortgage lenders will require a flood policy by law for a building in the high-risk flood zone when applying for a federally backed mortgage. Low risk does not mean “no” risk! In fact, 20% of actual flood claims paid by the NFIP are for properties in the low-risk zone. Be sure you are protected and reach out to a Wright Flood agent today. Insured survivors and their communities recover more fully and much quicker from the storm. There is no better time than now to build a strong culture of preparedness. Buy flood insurance, because that’s how America recovers. Call your agent or Wright Flood at (866) 373-5663 or visit Wright Flood Insurance today.